Home > Fire Safety & EMS > Fire Safety Evacuation Supplies & Tools > Fire Extinguisher Arrow Signs > Metal Fire Extinguisher Arrow Sign - 4" x 18"
Home > Fire Safety & EMS > Fire Extinguisher Arrow Signs > Metal Fire Extinguisher Arrow Sign - 4" x 18"
Home > Fire Extinguisher Arrow Signs > Metal Fire Extinguisher Arrow Sign - 4" x 18"
Metal Fire Extinguisher Arrow Sign - 4" x 18"
Our Fire Extinguisher Signs with down arrow are silk screen printed on heavy gauge aluminum, then oven-baked for extra durability. The metal signs feature pre-drilled mounting holes, rounded corners and smooth finished edges. Perfect for mounting on block or concrete walls. These bold red and white arrow signs will ensure your fire extinguishers are easy to locate when immediate action is required to prevent property loss or personal injury. 6 or more qualify for Free Shipping. Orders 20 or more will ship UPS Ground. 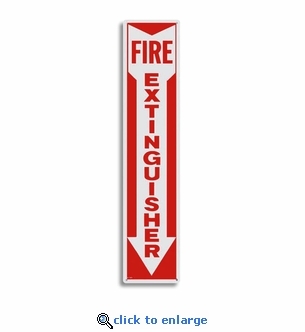 Metal Fire Extinguisher Arrow Sign - 4" x 12"